The birthday detective. The reverse mid-life crisis. Pieces falling. On the eve of the birthday of my 39th year, I celebrated the coming forth of another year, with a mild panic attack. On the Richter Scale, the tremors shook out to be around 1.000000041. A fractional shake up, yes, but they were felt. Some gloom and doom prevailed and in some circles, this might have been called a mid-life crisis. For most people, birthdays bring candles, cakes, flowers, and tons and tons of well-wishes. They do as well for me. But yet, birthdays are a mixed bag. It is panic in this disco. 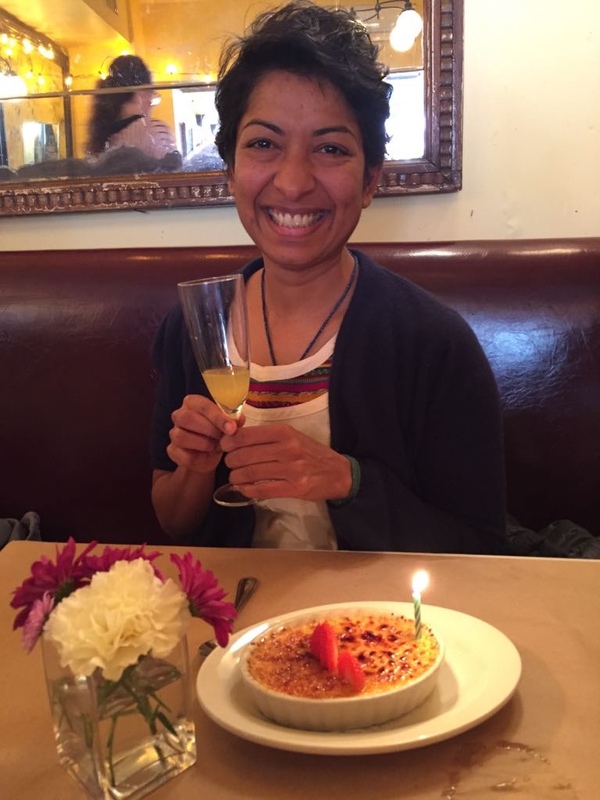 This year the birthday brought tons of gorgeous wishes, thankfully no flowers, phone calls, emojis, emoticons, many virtual hugs and a lovely date with my awesome friend of yore, R.
Thankfully R appreciated the ritual of birthdays enough to snap me out of my momentary hand-wringing. She gave me an awesome gift, a hug, and reminded me that it was not the right time to get all existential and angsty about what was a perfectly nice and sunny day. So we went out, ate, drank in the middle of the day, made merry, had a creme brulee and talked about life. I came back buzzy and proceeded to get the monkeys off my back. I then gifted myself the best gift ever- an evening in bed with a well-worn book. And sleep. I woke up the next morning resolute. On the second day of the fourth month of the year, I gifted myself the even bester best gift of all- the permission to be happy. I called this the year of Happiness. All else can wait. With happiness now in my front pocket, I thought that it was time now to get to the bottom of the kerfuffle, the birthday blues, which strike every year. So this year I hired the birthday detective. Sharp on a Thursday morning, the birthday detective came knocking. It was a loud, confident knock. And I shivered just a bit. I was not sure I was ready to receive. ‘Who is there..’ my slight, quivering mousy voice. “It is me, Esmeralda, the birthday detective”. “Yes, birthday girl. Open the door. I want to be in and out of here. I charge by the hour”. Gosh. She sounded like a pack of bees. ‘Okay. Awright. Pardon my jammies. Come….come on in’. Esmeralda wore red wellies, a black trench-coat, a red cape, a precarious hat, and glasses that were serious- like a heart attack. She came prepared with a broom, a hammer and a nail, a notepad, and a magnifying glass. A bicycle was parked up front, with saddle bags. She smoothed her cape, adjusted her hat and took over my couch. She looked bigger than life. I knew I was in trouble. ‘I… I… I feel saddled’. ‘I don’t know what to do with them.. they seem loaded’. “Loaded with what??? And what is your name again. Reads like apathy..” she scribbled quickly and furiously. ‘Loaded...with with.. expectation.....You can call me Rupes. But they bill me as Nirupa’. I sensed annoyance. Another case of the entitlement pandemic, she must have thought. ‘That I must be doing something on my birthday! That I must be doing…. doing you know…’ my voice trailed off into a half-baked plaint. Silence. The birthday detective must not have expected this. Even for the cushiest of the 1%. ‘And...And what is your name again?’ I asked desperate to break the silence. ‘NOTHING. is so not interesting Es-meh.’ A half high-pitched squeal. I was sounding desperate. I was positively wailing at this point. And the hand-wringing was giving me some mild cramps. Bahhhhhh. I made some shifty eye-contact. “You know what you want then”. She looked at me long and hard. A minute felt like an hour. She said- “Remove the perhaps”. Just say- “You know what you want”. The mantra was repeated with half-conviction. The delivery needed some vehemence. A silent audience in the peanut gallery clapped. The leaves outside rustled. All was quiet in the room again. A half screaming NO was just getting ready to leave my mouth. It was intercepted. Scoop. Pick up. Sweep. In one fell swoop, the pile of somethings-old things clutter was gone. She corrected her stern looking bat-woman glasses as she stuffed the saddle bags. I felt positively sheepish now. “Ok… my time is up. Thank you for allowing me to visit. Any last thoughts you would like to share with me. Any questions? And don’t forget to leave a good review on Yelp." I was relieved that I did not have to be attended thus. I could see that her patience was up. But I pressed. Relief.. I was staring at my feet. She handed me a clear plastic bag. She stood by the door. “You are OKAY. You are actually where you should be right now. You are going through a mid-life crisis, a reverse mid-life crisis. And like that she was gone. Clear, white bag rustling. And then Silence.